The only complete, up-to-date guide to construction project management that fully aligns with the latest PMBOK standards. Project Management for Construction is the up-to-date guide to construction-specific project management that fully reflects the latest standards in the "Project Management Body of Knowledge" (PMBOK). Unlike competitive texts, it covers not just project management process skills, but also crucial people skills such as teambuilding, communication, conflict management, leadership, motivation, decision-making, and negotiation. Topics covered include: project integration, scope management, time management, cost management, quality management, HR management, communication management, risk management, and procurement management. Readers will find up-to-date project management information related to LEED and green building construction, as well as introductions to all leading approaches to cost estimating, including CSI divisions, R.S. Means Assemblies Cost Data, and UNIFORMAT divisions. 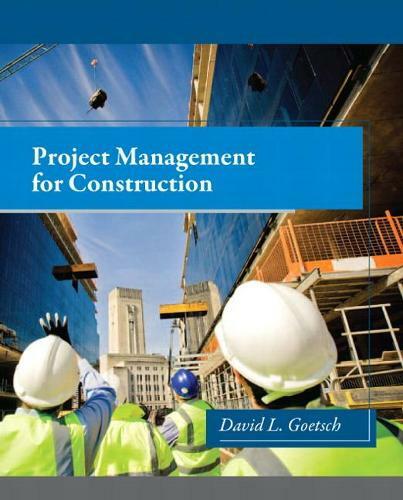 Throughout, key concepts are supported with a comprehensive package of pedagogical material, and teaching/learning aids provided in no other construction project management text.